Babylonian deity supposed to be referred to in Ezek. viii. 14. He is regarded as the husband, or sometimes as the son, of the goddess Ishtar, who descended to Hades every year in the fourth month, named after him,and remained there till the following spring. He is accordingly supposed to represent the spirit of the spring vegetation; and there was a period of mourning in Babylonia to mark the discontinuance of growth. 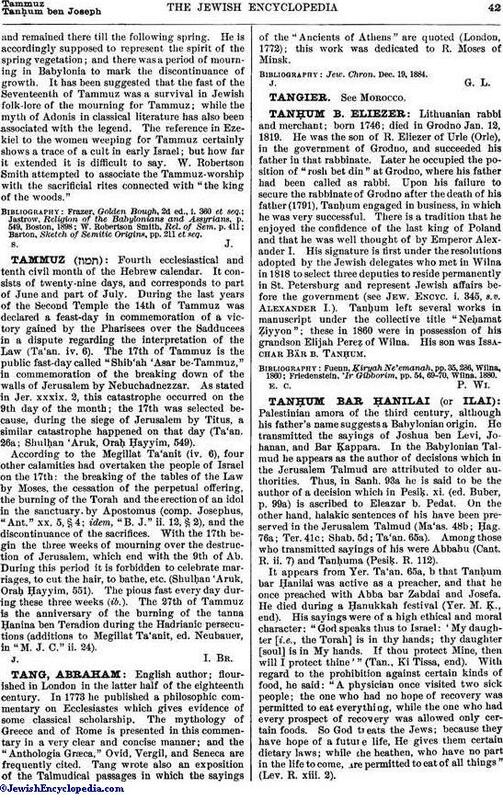 It has been suggested that the fast of the Seventeenth of Tammuz was a survival in Jewish folk-lore of the mourning for Tammuz; while the myth of Adonis in classical literature has also been associated with the legend. The reference in Ezekiel to the women weeping for Tammuz certainly shows a trace of a cult in early Israel; but how far it extended it is difficult to say. W. Robertson Smith attempted to associate the Tammuz-worship with the sacrificial rites connected with "the king of the woods." Barton, Sketch of Semitic Origins, pp. 211 et seq.